Point Gellibrand Coastal Heritage Park is a scenic coastal park which is located in Williamstown on the south-western side of Melbourne. A great place to spend some times in the outdoors, Point Gellibrand is popular for walkers and cyclists in Melbourne. Port Gellibrand was settled in 1835 as one of Victoria’s first permanent and seaport. From here, the shipbuilding industry grew, as did the population, housing and facilities located here. Make sure to check out Timeball Tower, Fort Gellibrand and the Bluestone Quarry which will give you an insight into the historical significance of this area. One of the most popular walks around here is from Fort Gellibrand over to the Williamstown Lighthouse. Another great walk is to head from Point Gellibrand to Jawbone Conservation. Follow the pathways with the ocean to your left, this walk will take around 1.5 hours and is 5kms in distance. 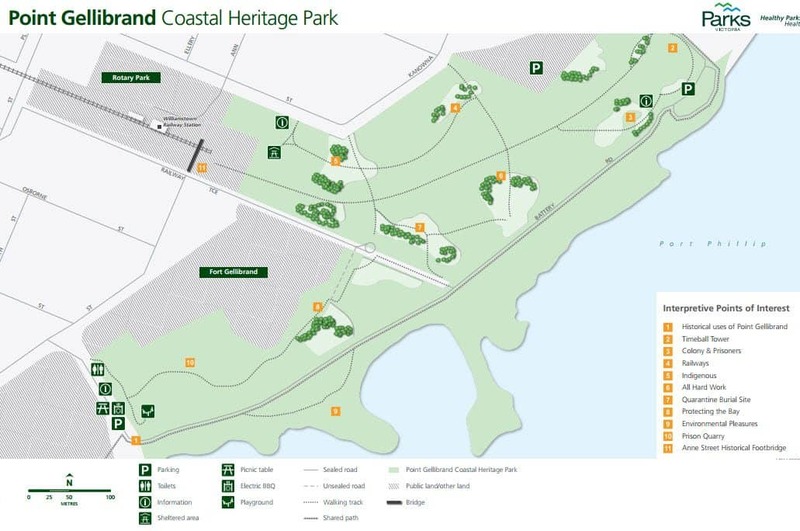 The south end of the Point Gellibrand Coastal Heritage Park has a playground where kids can enjoy the outdoors. The fort-themed playground is suitable for kids aged between 2 and 8 years. Other amenities on location include sheltered picnic tables, BBQ facilities, a fire place and clean toilets. There is also a baby changing facility and ample parking onsite.